We’d love your help. Let us know what’s wrong with this preview of Mosaic of Thought by Ellin Oliver Keene. How do students become thoughtful, independent readers who comprehend text at a deep level? To find the answers, authors Keene and Zimmermann embarked on a journey into the thought processes of proficient readers - a journey through poems and essays, classrooms and workshops, humor and reflection. 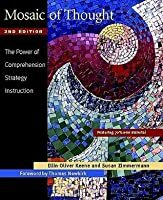 "Mosaic of Thought "chronicles that journey, which ultimately led the authors How do students become thoughtful, independent readers who comprehend text at a deep level? To find the answers, authors Keene and Zimmermann embarked on a journey into the thought processes of proficient readers - a journey through poems and essays, classrooms and workshops, humor and reflection. "Mosaic of Thought "chronicles that journey, which ultimately led the authors to elaborate on eight cognitive processes identified in comprehension research and used by successful readers. These serve as models for the strategies offered in this book - strategies intended to help children become more flexible, adaptive, independent, and engaged readers. "Mosaic" proposes a new instructional paradigm focused on in-depth, explicit instruction in the strategies used by proficient readers. The authors take us beyond the traditional classroom into the literature based, workshop-oriented classrooms. Through vivid portraits of these remarkable environments (all participants in the Denver-based Reading Project of the Public Education & Business Coalition), we see how explicit instruction looks in dynamic, literature-rich readers' workshops. As the students connect to background knowledge, create sensory images, ask questions, draw inferences, determine what's important, synthesize ideas, and solve problems at the word and text level, they are able to construct a rich mosaic of meaning. To ask other readers questions about Mosaic of Thought, please sign up. Mosaic of Thought was the first book I read about teaching English. Ten years ago, on the verge of leaving graduate school, I was introduced to Mosaic. I was blown away: it was as if the authors had taken off the top of my head, had observed my thought process while I was reading, and then held up a mirror to make me aware of what I was doing. In the years since I have returned to Mosaic many times over, using it as a seed text to pull teaching points from. 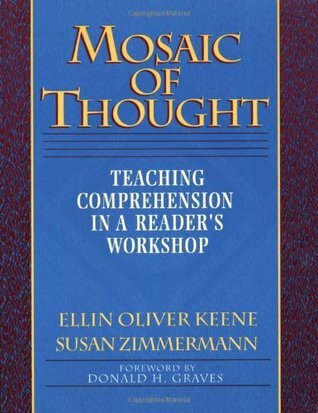 I found that Keene and Zimmermann of Mosaic of Thought was the first book I read about teaching English. Ten years ago, on the verge of leaving graduate school, I was introduced to Mosaic. I was blown away: it was as if the authors had taken off the top of my head, had observed my thought process while I was reading, and then held up a mirror to make me aware of what I was doing. In the years since I have returned to Mosaic many times over, using it as a seed text to pull teaching points from. I found that Keene and Zimmermann offered me ideas and theories, while Atwell, Calkins, and Harvey and Goudvis offered me actual strategies to use in the classroom. This book changed the way I teach reading! It opened my mind to the possibilities of helping children with comprehension and awakening children to the wonderful world of books. Each chapter has a wonderful breakdown of how to go about teaching each skill as well as wonderful examples of children's literature for teaching that reading comprehension skill. decided this text should be one I own when I read it versus borrowing from IL so I put it on hold until I got my own copy. Definitive text for reading strategy instruction including read alouds, conferring, crafting lessons (including gradual release). I LOVE this book! Meant for reading teachers, I find the simple techniques here easy to implement with my children, teaching them to get more out of their books. Interesting to read, I recommend it! I had a hard time getting through this classic. As another reviewer noted, a page-turner this book is not. With that said, I appreciated the practical insight the authors provided. Now that the comprehension strategies discussed in this book are somewhat commonplace, I found it nice to return to where a handful of them were shared for the first time. So much better than the last book I read for grad school. It was easy to follow and gave me some great ideas to implement not only for my ELA classes, but also my speech class. My only complaint is that I wish there were more high school examples throughout. I plan on trying to get some colleagues to borrow and read it. I had to give this four stars instead of five because it's not one that I remember well. Other education books just pop into my head, but not this one. I remember finding it useful and still have it in my collection. It's time I dig it out for a refresher. I read the book Mosaic of Thought because it was a requirement for one of my classes in school. While I can see how this book can be a helpful tool for current teachers, overall, I found the book extremely boring and would not have read it if it was not a requirement. Such a wealth of information on reading comprehension and teaching reading strategies. I would highly recommend this book to anyone who is teaching. This book is definitely not a page turner but provides a lot of constructive ways to teach English in the classroom. I'll definitely hang on to this book when I begin teaching English myself. This book encourages teachers to know themselves on a deep meta cognitive level so they can explicitly share the strategies they use when they are trying to comprehend texts. I really enjoyed reading this book. It was easy to understand and it includes useful tips. Mosaic of Thought was interesting reading material to me because it was reading about reading, mostly comprehension. It really talks about the importance of not just reading but comprehending what you read in the best way possible. While I thought the book dragged on a little too long and could have been more condensed. It gives thorough explanations of what it means to comprehend material. Honestly this book was a boring read for me. The way that the chapters were set up distracted me. I wanted the information presented first, with examples and additions to supplement the main idea after. As someone who is working towards becoming a teacher, I didn't feel connected to this book or like it really applied to me and my current situation. I did not love this book. I thought it had bits of really good information throughout the chapters, but overall I did not think it was a great read. I read this book for my English class and it was meant to be purposeful but it was honestly so hard to read. It was extremely boring and felt like a chore to read. Great book to educate future teachers or teachers on many practices they can use in their classroom. 1. I loved that the author’s demonstrated the metacognitive strategies with text that THEY read. This modeling is the strength of this book. I feel strongly that in order to be effective teachers of reading, we need to practice the strategies with text that we read. If we are unable to sift through, make connections, and synthesize challenging reading, neither can our students. 1. I loved that the author’s demonstrated the metacognitive strategies with text that THEY read. This modeling is the strength of this book. I feel strongly that in order to be effective teachers of reading, we need to practice the strategies with text that we read. If we are unable to sift through, make connections, and synthesize challenging reading, neither can our students. 2. The book works through seven metacognitive strategies in an understandable and usable format. 4. A favorite quote… “There is no program, no recipe, no prescription that will ever supersede the power of a well-informed and caring teacher.” So true! 5. Another favorite, “There should be times when teachers read aloud simply to give children the pleasure of listening to beautifully crafted literature, poetry, and non fiction.” This seems so obvious but yet gets lost in so many classrooms. More than anything, I want to instill the love for reading in my students. 6. Another point that resonated with me. Comprehension strategies are tools for understanding across the curriculum. A good reminder especially for middle school/high school students. 7. Good readers read more. Of course. 8. A line from the book, “For proficient readers, monitoring for meaning is a natural and often subconscious process.” Yes, but by teaching it directly, we provide students common language on how to discuss their process. 10. Loved the example of how to create images with students, and practicing creating images of the character’s histories. 11. Love, love, love, the “Capturing Thinking Areas” ideas. 12. Beyond the book report list on page 192-193 is awesome with oodles of ideas for responding to text. 13. Finally, loved the rubric in the end to guide the reader to think about how deeply they understand the material. Somehow I missed this widely known resource for teachers while in SF State credential program, but am so glad one of my students' teachers referred to it and got me into it. Ellin Keene and Susan Zimmermann wrote this mainly for the classroom, but the ideas and strategies are pertinenet for anyone trying to help students and themselves to have a deeper and more meaningful interaction with reading. It's a book I'll be returning to often. Here's a quote that relates directly to Lindamood-Bell's Vi Somehow I missed this widely known resource for teachers while in SF State credential program, but am so glad one of my students' teachers referred to it and got me into it. Ellin Keene and Susan Zimmermann wrote this mainly for the classroom, but the ideas and strategies are pertinenet for anyone trying to help students and themselves to have a deeper and more meaningful interaction with reading. It's a book I'll be returning to often. "Teachers know that students who struggle are often disengaged and don’t choose to read outside school (or within, for that matter!). Creating images can be the conduit to student engagement and is, therefore, especially important for students who struggle. Yet, we can’t take for granted that students create images spontaneously as they read. Many don’t. They don’t realize they should. The fact is many children spend a lot of time in front of screens—movies, television, video and computer—where a vast array of images is provided for them. Unless their image-making capacities have been nurtured as young children (being read to and told stories), they don’t realize they have the ultimate computer between their ears and enormous capacity to create their own images. They need explicit instruction as they develop and trigger their image-making abilities." Recommends it for: teachers and educators. I started reading this book 4 months ago. A page-turner it's not. It is written by teachers to help teachers learn to teach. I learned fascinating things from this, and really it seems that every teacher should read it or a book like it. We as Americans are incredibly under educated and unknowledgeable. Seeing the problems that Keene and Zimmermann were trying to solve back in the mid90s made me realize that it is laregely due to our reading - or the fact that we don't do much of it. Most people I started reading this book 4 months ago. A page-turner it's not. It is written by teachers to help teachers learn to teach. I learned fascinating things from this, and really it seems that every teacher should read it or a book like it. We as Americans are incredibly under educated and unknowledgeable. Seeing the problems that Keene and Zimmermann were trying to solve back in the mid90s made me realize that it is laregely due to our reading - or the fact that we don't do much of it. Most people I know might acknowledge that reading a book is not something that they think people like them really do. In addition to their practical advice and guidelines I seem to remember a bit where they mention that we are completely untrained in reading non fiction. I think that shows in our lack of geographic, historical, spiritual, and political education. As important as these messages are, I thought that an entire chapter on Inferences (for example) was a bit much. I am not a teacher, but I have read hundreds of books and have learned to do so thoughtfully, so I know what Inferences are. Reading about "Mimi" and "Rachel" practically the transcript about their supposedly discussing the Revolutionary War was a little like pulling teeth - except they were my own teeth!! I enjoyed reading this. It reminded me of Cziko's Reading for Understanding. I liked the way Ellin, one of the authors, started each chapter with a text, her think aloud of it, and how this played out in the classroom. The repetitive nature of each mini-lesson was ingrained in my head. Modeling think alouds, having students read individually while conferencing with students, sharing aloud after. I wish there were more high school examples. There is only one at the end and compared to the element I enjoyed reading this. It reminded me of Cziko's Reading for Understanding. I liked the way Ellin, one of the authors, started each chapter with a text, her think aloud of it, and how this played out in the classroom. The repetitive nature of each mini-lesson was ingrained in my head. Modeling think alouds, having students read individually while conferencing with students, sharing aloud after. I wish there were more high school examples. There is only one at the end and compared to the elementary school examples, it is rather brief and lacks details. While I enjoyed the telling of the individual mini-conferences with kids, it seemed important (necessary?) that the teacher had read the books the students were reading. Although I am a huge reader, I can't imagine having read each text my students might choose for SSR. I wonder how important that is. A highly intelligent, readable, insightful, and enjoyable piece on reading. Enlightening and pracical. Words of Wisdom: "John Cheever once said that he wrote 'to make sense of my life.' We read, I think, for the same reason: to make sense of our lives and to connect to those who have come before us and those who now share the planet with us. We read to do our jobs, to learn, to explore, to adventure, to bring order to chaos, to open new vistas, to better understand the world around us, and to dev A highly intelligent, readable, insightful, and enjoyable piece on reading. Enlightening and pracical. Words of Wisdom: "John Cheever once said that he wrote 'to make sense of my life.' We read, I think, for the same reason: to make sense of our lives and to connect to those who have come before us and those who now share the planet with us. We read to do our jobs, to learn, to explore, to adventure, to bring order to chaos, to open new vistas, to better understand the world around us, and to develop compassion for the human condition" (217).